Free Spirit Publishing, 9781575425016, 40pp. As parents and teachers know, yelling comes naturally to children. 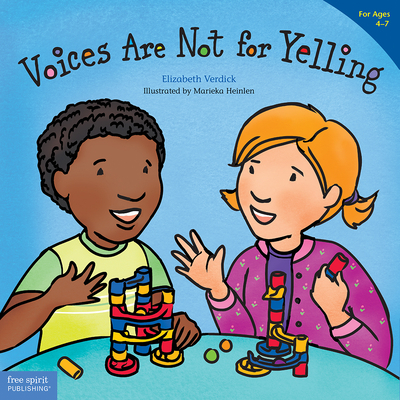 This friendly, encouraging book, geared to preschool and primary children, introduces and reinforces where and when to use an “indoor voice” or an “outdoor voice.” In classic Best Behavior style the author tells young readers, “Your voice is a powerful tool. How you use it is up to you.” Vivid illustrations show the times and places for an indoor voice, the ways people ask us to quiet our voices, and times when yelling might occur. “What happens if you’re mad or frustrated or really, really excited? Your voice gets louder and LOUDER.” But yelling hurts people’s ears and feelings. Children learn that they can quiet their voice and use their words to talk about a problem. “Think before you yell, and use your words well!” Includes a special section for parents and caregivers with activities and discussion starters. The Best Behavior series uses simple words and delightful full-color illustrations to guide children to choose peaceful, positive behaviors. Select titles are available in two versions: a durable board book for ages baby–preschool, and a longer, more in-depth paperback for ages 4–7. Kids, parents, and teachers love these award-winning books. All include helpful tips and ideas for parents and caregivers. Elizabeth Verdick is the author of more than 40 highly acclaimed books for children and teens, including books in the Best Behavior series for young children, the Happy Healthy Baby™ and Toddler Tools board book series, and the Laugh & Learn™ series for preteens. Her most recent titles include Noses Are Not for Picking, Play (Happy Healthy Baby), On-the-Go Time (Toddler Tools), Stand Up to Bullying! (Laugh & Learn), and The Survival Guide for Kids with Autism Spectrum Disorders (And Their Parents). She lives with her husband, two children, and five pets near St. Paul, Minnesota. Marieka Heinlen received her BFA at the University of Wisconsin, Madison, and also studied at Central Saint Martins College of Art and Design in London. She launched her career as an award-winning children’s book illustrator with Hands Are Not for Hitting and has illustrated all of the books in the Best Behavior and Toddler Tools series. Marieka focuses her work on books and other materials for children, teens, parents, and teachers. She lives in St. Paul, Minnesota, with her husband, son, and daughter.